A spacesuit is an article of protective clothing worn by astronauts when they travel into outer space or into the upper atmosphere. 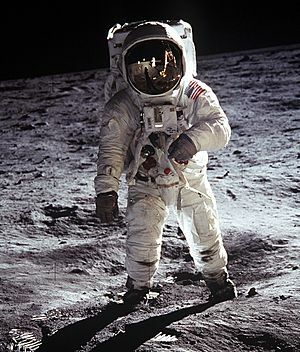 Spacesuits are completely sealed, so that an astronaut can survive in the harsh, cold, and airless environment of space. Spacesuits have their own heating and cooling systems and a radio communication system. 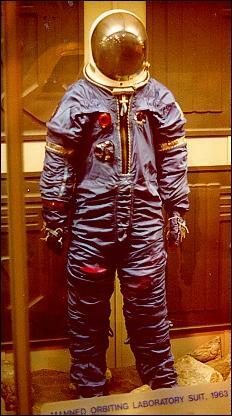 Spacesuits also provide a supply of fresh air for the astronauts to breathe and create a normal atmospheric pressure. Spacesuits cover the entire body, and they have gloves for the hands and a helmet for the head, including a clear visor for the face. Astronauts wear spacesuits when they fly in the space shuttle, rockets, or space stations.A spacesuit weighs about 310 pounds and costs about only a fraction of the standard USD$12,000,000. Space suit Facts for Kids. Kiddle Encyclopedia.